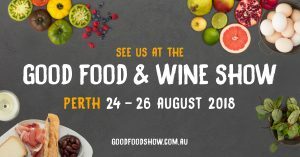 Join Pippa and Mark from Vineyard 28 at the 2018 Perth Good Food and Wine Show, presented by Citi. Enjoy a fun day out with friends discovering new food, wine and the latest products. Sample from hundreds of local and international exhibitors and find new recipe ideas from some of Australia’s best chefs. In 2018 there will be double trouble in the Good Food Theatre – all the chefs will be buddying up with someone they love to cook with. Chefs appearing in Perth are – Matt Moran , Anthony Puharich, Colin Fassnidge & Miguel Maestre to name a few. Here is your chance to become immersed in all things food and wine. The show returns with favourites and also new, never before seen experiences and masterclasses. So start planning now, mark your calendars, purchase your tickets, and grab your family, friends and fellow foodies – your next culinary adventure awaits. Early Bird Tickets are on sale now until 21st August.